Lisbon, 1974. Journalist Jack Telford must hunt down a killer, solve a deadly riddle, renew his acquaintance with an old flame, and survive Portugal’s revolution in this taut thriller with a life-and-death finale, which Jack may survive, but only at great cost. 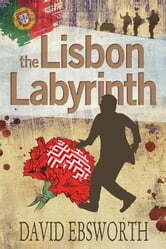 There is a dossier, upon which the whole of Portugal’s future may hang, and Jack's quest to find both the killer and the lost documents will drag him into a labyrinth of deception and danger. Will his best-intentioned actions perhaps have the worst of consequences? Is it too late for Jack’s past to be finally redeemed by love? And, in a world where nobody can be trusted, can Jack even trust himself? I love Lisbon so I really enjoyed all the references to places I know in the city. The background of the Carnation Revolution was also interesting and the author had clearly done a lot of research judging by the bibliography. However, I find it strange that neither he nor his editor seem to be aware that Richmal Compton was a woman.